Indian instant messaging platform, Hike Messenger, launched its ‘Total’ suite of apps earlier this year in January. The apps provide a number of internet based applications, including messaging, Hike Wallet, Rail Info, News, etc., which are capable of running without an active data plan. The applications make use of USSD to offer customers free and basic internet usage. 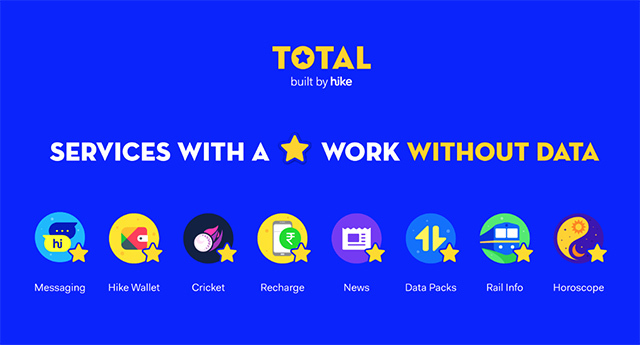 According to a recent report from The Mobile Indian, Hike has partnered with India’s largest telecom service provider Bharti Airtel to include its ‘Total’ suite of apps in select smartphones under the ‘Mera Pehla Smartphone’ scheme. The Total apps will come pre-installed in the budget smartphones which are expected to be launched in March 2018. Through the apps, first time smartphone users will be able to make use of essential services like Messaging, News, Recharge, etc. without an active data connection and browse the internet with data packs priced as low as Re. 1. Hike claims that Total is a refined version of Android which can be preinstalled on select smartphones. The app suite makes use of USSD-based technology to transfer data without access to internet. Hike has partnered with various operators to develop the proprietary system to provide free and basic internet usage. Other than that, Hike’s Total suite of apps will also be pre-installed on four smartphones from domestic manufacturers Intex and Karbonn.